The NH Dept. 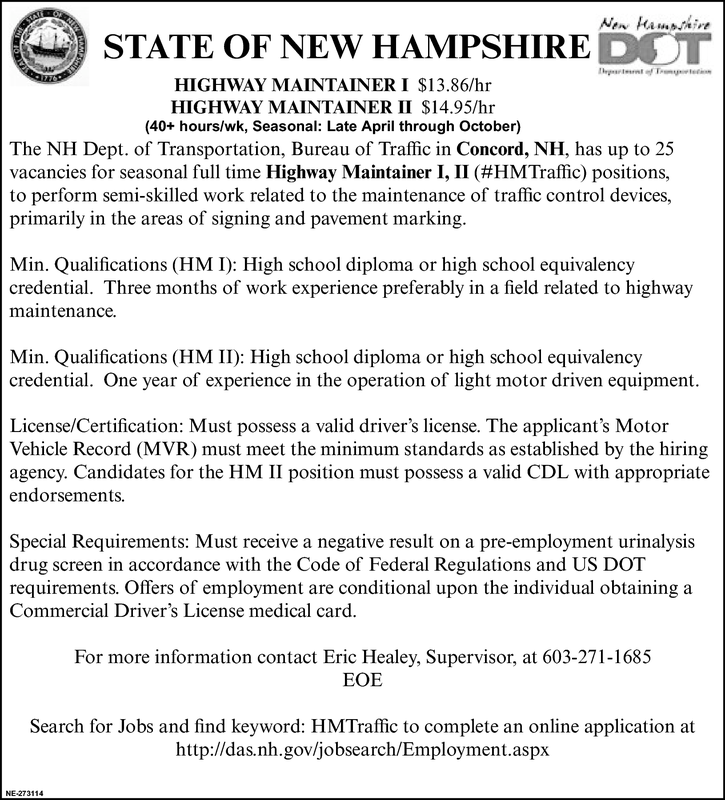 of Transportation, Bureau of Traffic in Concord, NH, has up to 25 vacancies for seasonal full time Highway Maintainer I, II (#HMTraffic) positions, to perform semi-skilled work related to the maintenance of traffic control devices, primarily in the areas of signing and pavement marking. Min. Qualifications (HM I): High school diploma or high school equivalency credential. Three months of work experience preferably in a field related to highway maintenance. Min. Qualifications (HM II): High school diploma or high school equivalency credential. One year of experience in the operation of light motor driven equipment. License/Certification: Must possess a valid driver's license. The applicant's Motor Vehicle Record (MVR) must meet the minimum standards as established by the hiring agency. Candidates for the HM II position must possess a valid CDL with appropriate endorsements. Special Requirements: Must receive a negative result on a pre-employment urinalysis drug screen in accordance with the Code of Federal Regulations and US DOT requirements. Offers of employment are conditional upon the individual obtaining a Commercial Driver's License medical card.